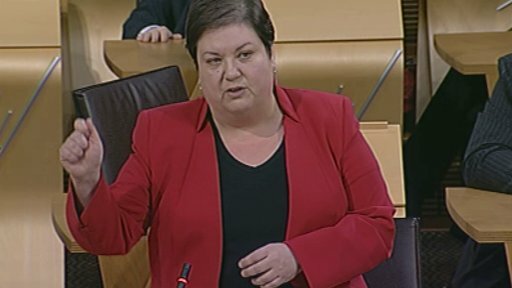 Today in a Labour Parliamentary debate, health spokesperson Jackie Baillie put forward a motion for the Cabinet Secretary for Health to back up his commitment that there will be no further cuts in beds, hospitals, doctors and nurses, following his speech to the Unison conference last month. The SNP amendment instead focused on the introduction of minimum unit pricing for alcohol. Jackie Baillie said, “It’s ludicrous that the SNP want to turn a debate about the future of our NHS into a statement on minimum unit pricing for alcohol. “The Cabinet Secretary is clearly running away from the assurances he gave to Unison just two weeks ago. Can we then assume his speech was mere rhetoric and not in fact the solid commitment to maintaining the resources we have in our hospitals that it appeared to be? “I would like to know what has changed in these two weeks that means his promises have disappeared? Will our already over-stretched NHS maintain the same number of beds, hospitals, doctors and nurses as he promised? Will there be further cuts despite the assurances we thought had been made? Has the Cabinet Secretary been silenced by his civil servants for making promises he cannot keep? This is an issue that requires serious debate. I fear however that this is a case of Alex Neil saying one thing in public and another in private.